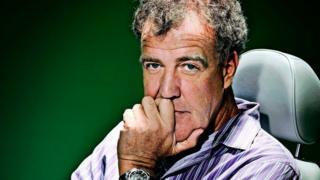 Top Gear host Jeremy Clarkson has been suspended by the BBC after what it called a "fracas" with a producer. Sources said he was accused of hitting the producer in an incident last week, and the remaining three episodes of the current series might not be broadcast. The BBC confirmed one episode - due for broadcast on Sunday - would not be shown, but gave few further details. Clarkson, 54, has not commented, but has been joking on social media about films that could replace Sunday's show. He was given what he called his "final warning" last May after claims he used a racist word during filming. In a statement earlier, the BBC said: "Following a fracas with a BBC producer, Jeremy Clarkson has been suspended pending an investigation. "No-one else has been suspended. "Top Gear will not be broadcast this Sunday. "The BBC will be making no further comment at this time." BBC News special correspondent Lucy Manning said sources had confirmed reports Clarkson was suspended for "allegedly hitting a producer". "The incident is believed to have happened last week, but was reported to the BBC on Monday and dealt with on Tuesday," she added. "The next two episodes of Top Gear will not be broadcast and it's understood that a third programme, the final of the series, is unlikely to be transmitted." In an exchange on Twitter, Clarkson and co-hosts Richard Hammond and James May have been suggesting films that could be aired in place of the Sunday's Top Gear episode. Later - in an apparent reference to Ed Miliband - Clarkson tweeted: "Sorry Ed. It seems I knocked your 'I'm a human' piece down the news agenda." Justine Miliband, the Labour leader's wife, has given an interview to the BBC saying she expects personal attacks on her husband to be "really vicious" as May's election approaches. This weekend's episode of Top Gear was set to feature Clarkson - who has fronted the show since 2002 - and his fellow presenters at a classic track day. Lineker has tweeted: "I don't think I'm ever meant to appear on Top Gear!" Former Top Gear presenter Chris Goffey told BBC Radio 5 live that, while discussions on the programme sometimes became heated when he worked on the show, it "must have been something fairly serious behind the scenes to warrant his immediate suspension". The show's executive producer, Andy Wilman, described last year as an "annus horribilis" for the programme. It followed an incident in Argentina where the presenters and crew were forced to flee the country after trouble erupted over a number plate reading H982 FKL - which some suggested referred to the Falklands conflict of 1982. October 2012 - The BBC Trust ruled comments by Clarkson which likened the design of a camper van to people with facial disfigurements breached disability guidelines.